The Damascus Christian girls basketball team is making a return to Baker City for this week's 1A state tournament after pulling off a 36-25 second-round win Saturday at Skyline champ North Douglas. The Eagles led most of the way, but found their margin down to a single point in the fourth quarter when Savannah Hale hit a 3-pointer that rattled the rim, touched the backboard glass and bounced on the rim some more before dropping through the net. "That deflated them a bit, and we were able to score a few more times right after to break their spirit," Damascus coach Dave Wakefield said. The Eagles also got a couple key buckets from Emily Powers down the stretch on her way to a game-high 12 points. "We noticed she had an advantage, so we ran some isolation plays for her and she came up with some big scores," Wakefield said. The Eagles also shot 7-for-11 (.636) on free throws in the fourth. 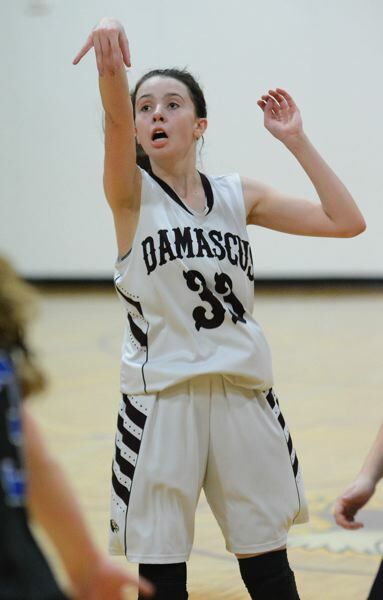 The Damascus defense held North Douglas to single digits in all four quarters, never allowing more than three baskets over any eight-minute stretch. "We locked down a couple of their big shooters and didn't give them any daylight — our defense is what prevailed in that game," Wakefield said. Damascus advances to face Days Creek in a 3:15 p.m. quarterfinal game Thursday in Baker City. The 1A tournament bracket is scrambled with five road teams winning Saturday, keeping four double-digit seeds alive. It also marks the first time since 2007 that Damascus will be sending both its boys and girls teams to Baker City. "It's very rare to get both teams to go — once in a decade if you are lucky," Wakefield said. "There are a lot of great memories to create along the way."